Being recognized as an Official Honoree by the Webby Awards is a great accomplishment and I really appreciate the recognition. The Webby Awards, the leading international honor for the Web, today recognized the online video series Dylan's Couch as an Official Honoree in both the Viral and Comedy - Long form or Series categories, a distinction that recognizes work exhibiting remarkable achievement. 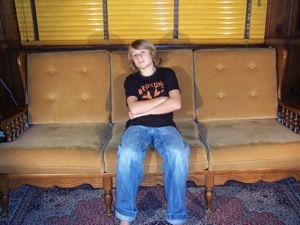 "Dylan's Couch" is produced on a shoestring budget by cinemafreaks, a production team which includes fourteen-year-old Dylan, the narrator and focus of the series. They received this recognition alongside established media producers such as NBC, CBS Interactive, IFC, and MTV Networks / Atom Films. Hailed as the "Oscars of the Internet" by the New York Times, The Webby Awards is the leading international award honoring excellence on the Internet, including Websites, Interactive Advertising, Online Film & Video, and Mobile Websites. The awards are judged by the International Academy of Digital Arts & Sciences, a global organization that includes David Bowie, Harvey Weinstein, Arianna Huffington, Matt Groening, Jamie Oliver, Internet inventor Vinton Cerf, and RealNetworks CEO Rob Glaser. "The Webby Awards honors the outstanding work that is setting the standards for the Internet," said David-Michel Davies, executive director of The Webby Awards. "The Official Honoree selection of the Dylan's Couch series is a testament to the skill, ingenuity, and vision of its creators." "When we started the Dylan's Couch series, I never imagined that we would receive an honor like this," Dylan said. "Being recognized as an Official Honoree by the Webby Awards is a great accomplishment and I really appreciate the recognition." The 12th Annual Webby Awards received nearly 10,000 entries from over 60 countries and all 50 states. Out of more than the 10,000 entries submitted, fewer than 15% received this honor and were deemed an Official Honoree. Dylan's Couch is an online video series which launched in October 2006. Its production team, cinemafreaks, includes fourteen-year-old Dylan, the narrator and focus of the series. The content of the series can best be summed up in the words of its theme song - "Dylan talks about things that nobody cares about, but you watch anyway... you can't look away..." Dylan's Couch can be viewed on the Dylan's Couch website and the cinemafreaks' YouTube channel. Hailed as the "Oscars of the Internet" by the New York Times, The Webby Awards is the leading international award honoring excellence on the Internet, including Websites, Interactive Advertising, Online Film & Video, and Mobile Websites. Established in 1996, the 12th Annual Webby Awards received nearly 10,000 entries from all 50 states and over 60 countries worldwide. The Webby Awards is presented by The International Academy of Digital Arts and Sciences. Sponsors and Partners of The Webby Awards include: Adobe; The Creative Group; Verizon; AOL Video; dotMobi; Level3; Adweek; Fortune; Reuters; Variety; Wired; IDG: Brightcove; PricewaterhouseCoopers; 2advanced.Net; KobeMail and Museum of the Moving Image. The International Academy of Digital Arts and Sciences is dedicated to the creative, technical, and professional progress of the Internet and interactive media. The Academy is an intellectually diverse organization that includes over 500 members consisting of leading experts in a diverse range of fields, such as musician David Bowie, Internet inventor Vinton Cerf, Naked Chef Jamie Oliver, fashion designer Max Azria, "Simpsons" creator Matt Groening and Real Networks CEO Rob Glaser. The Webby Awards and The International Academy of Digital Arts and Sciences are registered trademarks of International Data Group. For more information, visit International Data Group.